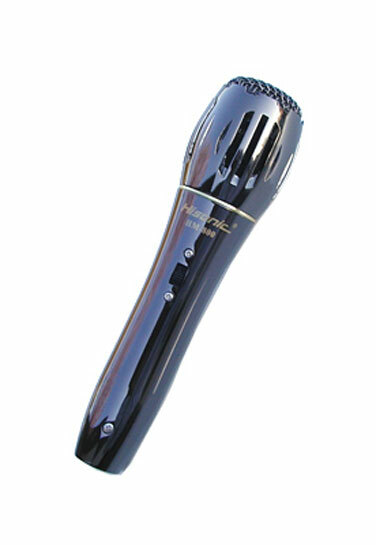 HM-800 microphone is a versatile professional dynamic microphone of exceptionally high quality. A super efficient magnetic circuit design utilizing twin AlNiCo magnet elements provides maximum output level for an improved signal-to-noise ratio for all vocal and sound reinforcement applications. HM800's frequency response is optimized for vocal application by controlling proximity effect through its low-frequency rolloff. The HM800's extended frequency response provides a clarity normally found only in condenser microphones. Throughout the HM800's full frequency range, the hypercardioid pattern of the HM800 stays uniform and symmetrical to significantly cut off any feedback and off-axis coloration. Advanced design in the shock-mounted microphone element and delicately finished surface keep handling noise extremely low. The extraordinary features of sound clarity and transparency, high output, extremely low handling noise, uniform hypercardioid pickup pattern, and delicately designed and finished surface make the HM800 microphone an outstanding value in any critical vocal application. HM800 comprises a low impedance element with extremely light weight diaphragm for excellent transient response and a wide frequency range with exceptional detail and clarity. HM800 contains twin AlNiCo magnet elements precisely constructed in a housing having wide dynamic range for smoothly reproducing a clear and uncolored sound. With low-frequency rolloff and extended high-frequency response, the HM800 captures the original vocal sound with extraordinary clarity. Tight hypercardioid pattern stays uniform and symmetrical throughout the HM800's entire frequency range to minimize feedback. The standard package includes a HM800 microphone, and a 20' microphone cable in a box. The microphone cable can be a low impedance cable (XLRF-XLRM) or an XLR - 1/4" cable. Musician / lead singers; disc jockey (DJ); karaoke jockey (KJ); church; school; conference room; karaoke; home entertainment.